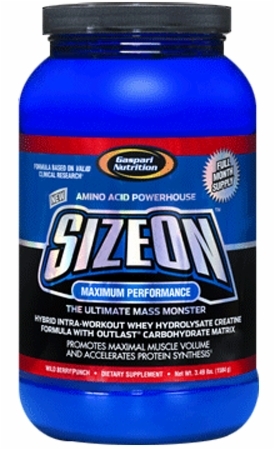 Gaspari took Sports Nutrition to the highest level with SizeOn, the original intra-workout creatine drink. There wasn’t any doubt it represented a serious innovative leap forward in the creatine category. SizeOn clearly demonstrated in a clinical setting that it destroyed its competition and quickly became known as the King of Creatines. As clinical research advances, so does Gaspari Nutrition which is why SizeOn has now evolved into the Ultimate No Added Carbohydrate Hybrid Intra-Workout Whey Hydosylate Creatine Formula. Once again Gaspari Nutrition raises the bar even higher in the sports nutrition industry and has offered you a no added carbohydrate version of its original masterpiece! Gaspari Nutrition uses 12 grams of a high quality whey hydrosylate that contains over 50% di & tripeptides as well as a large array of anabolic promoting ingredients such a high dose of L-LEUCINE (5 grams) to allow for unparalleled increases in athletic performance, skeletal muscle recovery, explosiveness and most notably, immediate increases in muscle size WHILE YOU ARE STILL TRAINING. To top it off, we also included LOLA™, our cutting-edge, ammonia scavenging amino acid salt of L-Ornithine and L-Aspartate to help battle fatigue. The bottom line is that Gaspari Nutrition has once again outdone itself and yet again redefined the very category it created. WHAT DOES SIZEON PRE-CONTEST DO?